The Median Nerve passes from the arm, through the wrist, and into our fingers. At the center of the wrist joint, the Median nerve goes through a passageway called the Carpal Tunnel. Our wrist bones form the bottom of the Carpal Tunnel. The Transverse Carpal Ligament covers the top. Ligaments are strong bands of tissues that connect bones together. 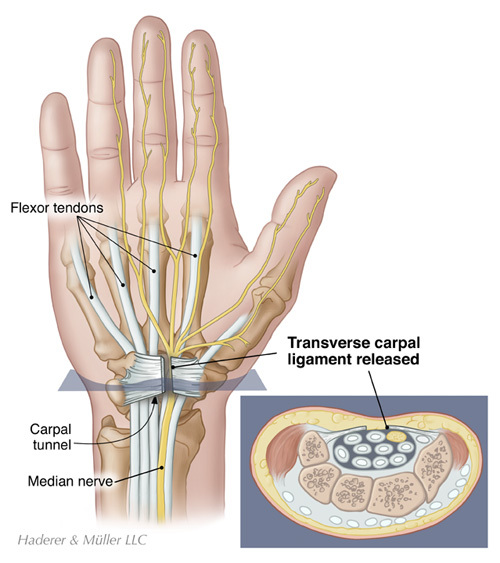 In addition to the Median Nerve, the Carpal Tunnel also contains many tendons. These tendons attach to the muscles that allow our fingers to bend or flex. The Median Nerve supplies the sense of feeling to our thumb, index finger, middle finger, and half of the ring finger. It also sends messages to the Thenar Muscles that move the thumb. We use the Thenar Muscles when we position our thumb to grasp and hold objects. If the Median Nerve is compressed in the Carpal Tunnel, it will send faulty messages as it travels into the hand and fingers. Carpal Tunnel Syndrome develops when the tissues and tendons in the Carpal Tunnel swell and make the area within the tunnel smaller. This can happen in association with other medical conditions or when the tendons are irritated from overuse. 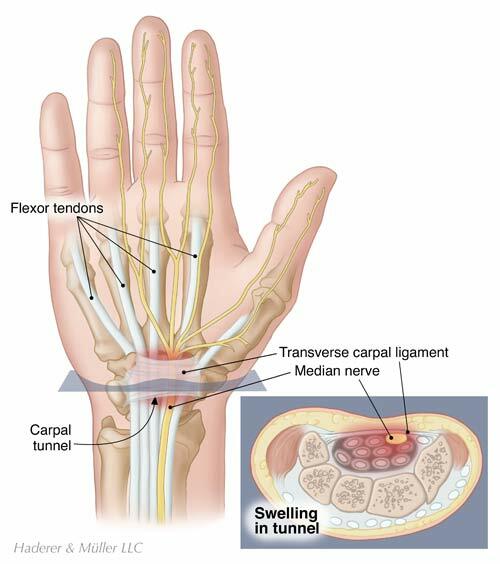 The increased pressure within the tunnel causes the Median Nerve to become compressed. The pressure disrupts the way the nerve works and causes the symptoms of Carpal Tunnel Syndrome. Usually, the cause of Carpal Tunnel Syndrome is unknown. However, there are several circumstances that can create pressure on the Median Nerve. Pressure may develop from prolonged wrist positioning that compromises the position of the median nerve. The median nerve may become irritated when our wrists are bent downward or flexed for long periods of time. Irritation may occur when the wrist is flexed and the hand is turned towards the side of the little finger. We position our hands like this when we hold on to the handlebars on a bicycle or the handles used to push a wheelchair or a lawnmower. These hand positions are also used when we grasp carpentry tools, such as the handle on a hammer or a paint roller. Other factors that appear to contribute to the development of Carpal Tunnel Syndrome include cold temperature and repetitive, forceful, vibratory, and fast movements, such as those used in the meat packing industry. Some medical conditions, such as diabetes and thyroid disease, are associated with Carpal Tunnel Syndrome. Rheumatoid arthritis, joint dislocation, and fractures can cause the space in the tunnel to narrow. Some women develop Carpal Tunnel Syndrome because of swelling from fluid retention caused by hormonal changes. This may occur during pregnancy, premenstrual syndrome, or menopause. The primary symptoms of Carpal Tunnel Syndrome are pain, numbness, and tingling. The numbness and tingling is typically present in the thumb, index, middle, and half of the ring finger. Some people describe the pain as a deep ache or burning. Your pain may radiate into your arms. Your thumb may feel weak and clumsy. You may have difficulty grasping items, and you may drop things. Your symptoms may be more pronounced at night, when you perform certain activities, or in cold temperatures. Your doctor can diagnose Carpal Tunnel Syndrome by conducting a medical examination, reviewing your medical history, and asking you about your activities and symptoms. During the physical exam, your doctor will check your wrist and hand for sensation, and perform a thorough hand examination. Your doctor may ask you to perform a couple of simple tests to determine if there is pressure on the Median Nerve. For the Phalen’s Test, you will firmly flex your wrist for 60 seconds. The test is positive if you feel numbness, tingling, or weakness. To test for the Tinel’s Sign, your doctor will tap on the Median Nerve at the wrist. The test is positive if you feel tingling or numbness in the distribution of the median nerve. Lab tests may be ordered if your doctor suspects a medical condition that is associated with Carpal Tunnel Syndrome. Your doctor may take an X-ray to identify arthritis or fractures. In some cases, physicians use nerve conduction studies to measure how well the Median Nerve works and to help specify the site of compression. Physicians commonly use a test called a Nerve Conduction Velocity (NCV) test. During the study, a nerve is stimulated in one place and the amount of time it takes for the message or impulse to travel to a second place is measured. Your doctor will place sticky patches with electrodes on your skin that covers the Median Nerve. The NCV may feel uncomfortable, but only during the time that the test is conducted. An Electromyography (EMG) test is often done at the same time as the NCV test. An EMG measures the impulses in the muscles to identify poor nerve input. Healthy muscles need impulses to perform movements. Your doctor will place fine needles through your skin and into the muscles that the Median Nerve controls. Your doctor will be able to determine the amount of impulses conducted when you contract your muscles. The EMG may be uncomfortable and your muscles may remain a bit sore following the test. Surgery is recommended when non-surgical options do not work or if the condition becomes worse. There are a few types of outpatient surgery to remove pressure on the Median Nerve. Your doctor will help you decide which option is best for you. The standard surgery for Carpal Tunnel Syndrome is called an Open Release. The surgeon will use a local or regional anesthetic to numb the hand area. For this procedure, the surgeon makes a two to three inch opening along the palm. This allows the surgeon access to the Transverse Carpal Ligament, the roof of the Carpal Tunnel. The surgeon makes an incision in the Transverse Carpal Ligament to open the tunnel and make it larger. By doing so, pressure is taken off of the median nerve. The surgery time for an Open Release is short, only about fifteen minutes. 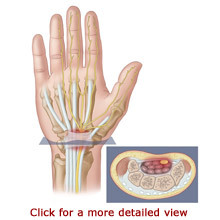 Another surgical option is called Endoscopic Carpal Tunnel Release. This type of surgery is done using an endoscope placed in a small incision. An endoscope is small device with a light and a lens that allows the surgeon to view the Carpal Tunnel without disturbing the nearby tissues. It may be used in conjunction with a camera or video system. 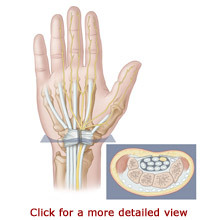 Endoscopic Carpal Tunnel Release most often uses a local or regional anesthetic to numb the wrist and hand area. In some cases, individuals are sedated for the surgery. The surgeon makes a small opening below the crease of the wrist and inserts the endoscope to view the Carpal Tunnel. Some surgeons make a second incision in the palm of the hand. Guided by the endoscope, the surgeon places a tube called a cannula along the side of the Median Nerve. A special surgical instrument is inserted through the cannula that makes an incision in the Transverse Carpal Ligament. This surgery also opens the Carpal Tunnel and makes it larger to take pressure off of the Median Nerve. Because Endoscopic Carpal Tunnel Release spares some of the tissue in the palm, individuals may heal faster and experience less discomfort. The symptoms of Carpal Tunnel Syndrome can often be relieved without surgery. Some medical conditions associated with Carpal Tunnel Syndrome can be treated. For some people, refraining from the activities that cause discomfort will make the symptoms go away on their own. You may find it helpful to change your patterns of hand use, take breaks from repetitive activities, and use positioning devices at your workstation to relieve pressure on the Median Nerve. Some cases of Carpal Tunnel Syndrome respond to treatments that relieve pain and provide rest. Your doctor may recommend that you wear a splint at night to support your wrist and relieve pressure on the median nerve. Splints may also be worn during activities that aggravate your symptoms to position the wrist properly and provide wrist support. Your doctor may suggest over-the-counter anti-inflammatory medication to help reduce your pain and swelling. Sometimes doctors choose to inject corticosteroid medication to provide symptom relief. Your doctor may recommend that you participate in therapy following non-surgical or surgical treatment. A therapist can teach you exercises to gain strength, joint stability, and coordination. It may take several months for strength in the wrist and hand to return to normal. A therapist can make recommendations to help improve your function with daily tasks. A therapist can make work station modifications and recommend different ways to perform your activities to reduce the chance of future problems. For instance, if you type or work on a computer, it may be helpful to have your therapist examine your workstation. There are several products that may help you improve your posture and aid in wrist positioning during activities such as typing. These specialists may also be able to recommend tools with special grips or handles to provide you with better wrist positioning. Work and activity modifications may help to relieve pressure on the median nerve. This can include eliminating activities that cause symptoms or taking frequent rest breaks when performing such activities. Following surgery, your incision will be wrapped in a soft dressing. Your physician may recommend that you wear a splint to provide support and promote healing. You will be able to move your fingers immediately after surgery. You will need to avoid heavy grasping or pinching motions for about six weeks. Recovery from Carpal Tunnel Surgery is individualized and depends on the extent of the condition and the type of surgery performed. Your doctor will tell you what to expect. Endeavor Physical Therapy is an outpatient physical and hand therapy clinic that provides premier physical therapy intervention to patients suffering from musculoskeletal injuries pre-operatively or post operatively. At Endeavor Physical Therapy, our providers offer Physical Therapy, Hand Therapy, Dry Needling, and a Workers' Compensation Program to patients in the Austin, Texas area.